Canvasflow connects seamlessly to Pugpig 'Publish' - Pugpig's lightest, fastest, most flexible publishing platform. It is quick and easy to get started. From the Publication Manager, select the publication you wish to connect and click the 'settings' button. Select the 'Publish Channel' tab and click the '+' button. 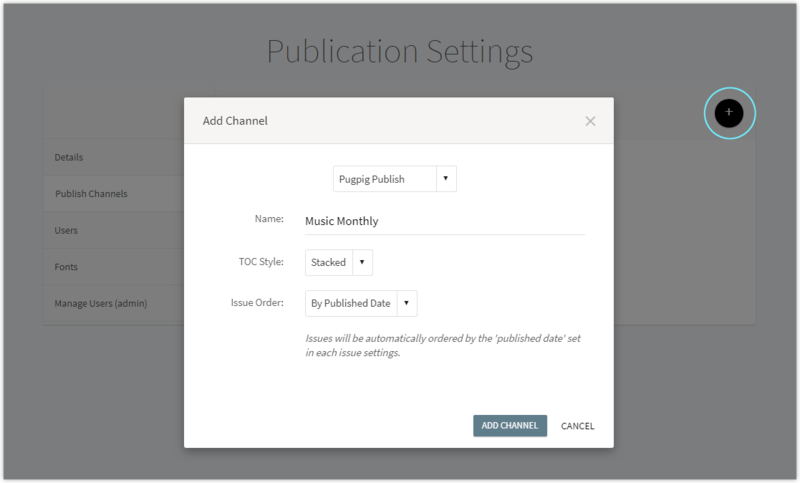 Select 'Pugpig Publish' from the list of available channels. Give your channel a name. You may find it useful to give it the same name as your Pugpig App. If set to ' Publish Date', Canvasflow will automatically order all issues in the publication by publish date, from recent to oldest. This option supports the 'Promoted' feature which allows you to set the order of individual issues so they appear out of the default flow. If set to 'Manual', Canvasflow will enable you to manually control the order of how issues are ordered within a publication. Click 'Add Channel'. The Pugpig channel will be created and connected to the current publication. It's possible to change the ToC style and Order mode at any time.